Hollywood is on the threshold of a breaking point in the tidal wave of true stories that have been crashing (and burning) on to the shore of movie theaters for the last decade or so. Every year, new biopics that attempt to bait the Oscars with tired formulas, cliched narratives, and virtually no wide cinematic releases are unleashed to the coasts and end up nestling on the back pages of film magazines, usually gaining minute notoriety on Netflix or Amazon Prime. One such picture that I dread will suffer the same fate, and unfortunately it’s not difficult to comprehend the reason, is the new picture The Dark Horse. There are so many things wrong with this picture, none of them born from utter carelessness. However when undertaking the storytelling of a major individual who was to have changed the lives of many people, there should be an extra spark that sets the film apart. It’s not here. Cliff Curtis’ performance leaves much to be desired in The Dark Horse. 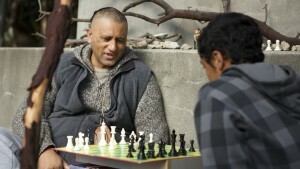 It’s an ambitious effort, proposing the real-life story of Genesis Potini (Cliff Curtis, who manifests in the film’s only compelling performance), a New Zealand chess player who suffered from severe bipolar disorder, overcoming his adversities by passing on his knowledge of chess to the community of troubled young adults and children. He’s also torn between his own mental crashes and his his initiative to help get his nephew Mana (James Rolleston) out of a gang initiation. Written and directed by James Napier Robertson, who also plays a small role in the film, the film apparently swept awards festivals in New Zealand, but none of that luster survived the sea to the states. The film is an exercise in the inquiry of criminal filmmaking. The film being produced by four different production companies—which is never a good sign—buttresses it’s own insecurity. Adding to the fact that the film was first issued in to cinemas overseas in 2014, and is only now surfacing on screens, says even less. The film opens with a gut churning, cliche hand-held camera shot of lead actor Curtis walking in the rain with no umbrella. It’s nothing audiences anywhere haven’t seen before. More importantly, it raises the concern as to how every drama of this nature tends to fall upon such cinematic shortcomings. The sloppy, shaky camera has become synonymous in arthouse cinema and is a tired, worn narrative that is expected. Bad for the film and shameful for the director, for making such a choice. Such choices are to be examined. A film by it’s own definition of existence is, for the most part, to give audiences something they’ve never seen before—this is the fundamental reason most people (who actually spend their money seeing the film, in leiu of talking or texting through it) attend in the first place. But films like Dark Horse simply are NOT anything that audiences haven’t seen before, and it has nothing to do with used and re-used plots, devices, or lack of styles. It’s the fact that a film of this proportion could easily have been so much better. There were myriad opportunities for the filmmakers to be innovative and create moments, reflections, and ultimate points with which to gauge the story. And it’s these little nuances that help make a film great— and of which this film completely lost out on. Another problem here, is that the writer/director is more identified as an actor himself, which is always problematic because these actors who turn behind the camera, 9 out of 10 times think they know what they are doing when they haven’t slightest idea. Oh sure, they rack up awards here and there and are fed encouragements which they believe to be truths or facts, but this NEVER shows when the film finally screens. It’s nothing more than cheap short shots strung together, as if stitched by a home economics student. The worst part about it is, too, that these horrid bits scenes that couldn’t lay the direction of a railroad track are the only driving force to the story. Not even the story is present enough to do that! It’s a method that’s become most frustrating and terse, and doesn’t relay anything for the audience to feel. Without these petty contrivances , we have what could have been a truly remarkable picture. The ambition is there, but an actor/wannabe director is usually always the first in the weakest link chain of errors that causes these ambitious projects to fall out of the bunk. The one good thing that can be said about this picture is that it will probably put audiences at a more aware advantage to how films are being churned out with no real importance or detail to how they should be structured. The Dark Horse is currently playing in select cinemas nationwide.